The new Silverman Hall houses 16 research groups and about 245 faculty, staff and research assistants in chemistry, biology and engineering. Each of the five floors contains state-of-the-art research laboratories. The ground floor features the Center for Advanced Molecular Imagery (CAMI) that researchers, from the Evanston and Chicago campuses, use to image molecules, chemical reactions and magnetic resonance contrast agents. 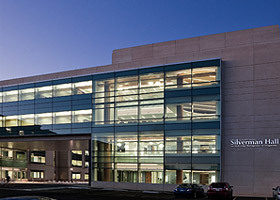 The building also houses the Proteomics Center of Excellence, the Center for Molecular Innovation and Drug Discovery, NIFTI and Computational Bioinformatics. In accordance with Northwestern’s policy of using environmentally sustainable design, the facility includes such elements as a large underground cistern, chilled beams, a reflective roof, an automatic lighting system and the use of recycled and regional materials, which all contributed to the building receiving LEED Silver certification. E Cube’s commissioning services included the following systems: mechanical, electrical, plumbing, building automation, life safety, and laboratory fume hoods and gases.